Image caption The number of arts teachers in schools had fallen 11% since 2010, the report said. Creativity and the arts are being squeezed out of schools, a major report has said. Cultural experiences and opportunities were being closed off to youngsters, especially those from poor backgrounds, the Warwick University report said. There had been a significant decline in the number of state schools offering arts subjects taught by specialist teachers, it added. The government said the arts was a key part of the national curriculum. The report, the Warwick Commission on the Future of Cultural Values, found that between 2003 and 2013 there was a 50% drop in GCSE entries for design and technology, 23% for drama and 25% for other craft-related subjects. In 2012-13, only 8.4% of students had combined arts and science at AS level, it said. It cited figures showing that since 2010, the number of arts teachers in schools had fallen by up to 11%, teaching hours and teachers for design and technology were down 11%, drama teacher levels had fallen by 8% and teaching hours for the subject, including hours taught by non-specialists, had reduced by 4%. The number of art teachers had also fallen by 4%, while the subject had seen a 6% decline in teaching hours, it added. The research also suggested that the cost of young people taking part in some extra-curricular activities was putting them out of reach for low-income families. Researchers said that without action, there was a risk of creating a "two-tier" system, in which only the most advantaged youngsters had access to a wide range of experiences. The report, into the value of culture in modern British society, was drawn up by a special commission involving cultural leaders and academic experts. It found that youngsters born into poor families with few qualifications were the least likely to work and be successful in cultural and creative industries. These children were also less likely to take an interest in and appreciate the arts as part of the school curriculum and have parents who valued public-funded arts and heritage. The study also cited recent research that found while 76% of parents had said that their children regularly took part in arts clubs and cultural experiences outside of school, there were significant costs associated with them. "There are major concerns that the educational system is not focusing on the future needs of the cultural and creative industries and the broader needs for innovation and growth in the UK," the commission said. "There is a general agreement within the cultural and creative industries, and industry more broadly, that the government's focus on science, technology, engineering and maths (Stem) should include the arts (Steam). But the commission said ministers were "obsessed with a siloed subject-based curriculum" and early specialisation in arts or science. "We need creative scientists as much as we need artists who understand the property of materials and the affordances of new technology," it said. Warwick University researcher, and commission member Prof Jonathan Neelands, said: "Without educational intervention, we are in danger of allowing a two-tier creative and cultural ecosystem in which the most advantaged in social and economic terms are also the most advantaged in benefiting economically, socially and personally from the full range of experiences and value in that prevailing system." 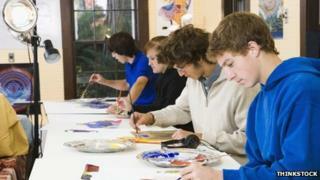 A Department for Education spokesman said arts subjects were statutory in primary schools and up to the start of GCSEs. And he highlighted that the number of pupils taking music; and art and design GCSE had risen between 2013 to 2014. "As part of our plan for education, we are ensuring all pupils experience a broad and balanced curriculum which will prepare them for life in modern Britain - the arts are a key part of this. "We are clear that arts education should be every bit as rigorous as the rest of the school curriculum, and we have strengthened the national curriculum in these subjects and reformed the music and art GCSEs and A-levels to make sure this is the case." The DfE added that it was providing £109m for 2014-15 to support music, art and cultural education projects - £17m more than the previous year.